Max Litchfield and Rosie Ruidin are both members of 'Team Steel', their nickname for the famous City of Sheffield Swim Club, set up in 1981 and based at Ponds Forge. 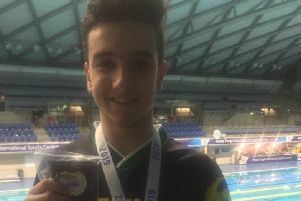 Litchfield, 22, qualified for the World Championships, hosted in Budapest this weekend, by winning gold in both the 200m and 400m Individual Medley at the British Swimming Championships in Sheffield crowd in April. He made his Olympic Games debut for Team GB in 2016 where he reached the final in the Men's 400m Individual Medley and was a whisker away from a podium finish as he beat his personal best to finish fourth. Max's younger brother, Joe, is also a star of the future but although he will not be competing in Budapest alongside his brother, Max is feeling confident about this weekend. He said: “My mindset is good going into Budapest, I have had a slight shoulder niggle over the past week but I know I have done the work and know we will be in a great place! Unfortunately not all the Litchfields will be out in Budapest, however my dad will be there cheering on from the stands. Litchfield's pride is shared by Rosie Rudin, 18, who won her debut British title at Ponds Forge in April after touching first in the Women's 200m Backstroke. Rosie is a newcomer to 'Team Steel' but has praised the help and support she has received since she joining the club from the Nova Centurian Swimming Club in Nottinghamshire. She added: “I only moved to Sheffield in September but it's been such a good year with Team Steel. Rosie cannot wait to hit the water in Budapest and is determined to make the most of the chance she has this weekend. She said: “It's such a privilege to represent your country especially at senior level. It'll be a new experience as my first senior GB international but I'm really excited to see what I can do.